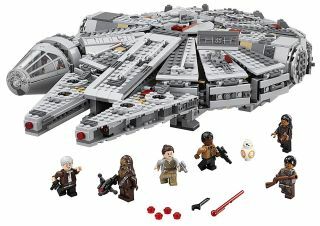 Lego's new "Star Wars" Millennium Falcon 75105 building kit is ready to zoom through space at a discounted price of $116 (Regular Price: $119). This intergalactic voyager comes with 1,329 pieces and includes six minifigures: Rey, Finn, Han Solo, Chewbacca, Tasu Leech a Kanjiklub Gang Member, and an adorable little BB-8. The gang comes complete with their specialized space weapons. Open up the top to see what's going on inside the spaceship, then close the doors to safely transport the crew during their Lego space adventures.